Connecting the projector to a computer or laptop takes time. Do not think that the projector as well as TV. In the operation of this device has its own nuances. It is not a Plug-and-Play. Much of the time is the heating of the projector and its setup. If you are working with the operating system Windows Seven, in this case, you can save much time the projector is turned on. Projector, computer, operating system Windows 7. Quick inclusion to provide knowledge of a single key of your keyboard is English letter P. Why this letter? Projector English written Projector. Most of shortcuts the line of Windows are formed from abbreviations of words. For example, to open a file is Ctrl + O (Open), to save press Ctrl + S (Save). Thus, to switch on the projector, use the key combination Win +P. If you don't know where the Windows key, note the key that is between Ctrl and Alt keys (with image Microsoft company logo). With the first point is clear – this is the standard mode. A duplicate monitor is on, the projector will display all the actions you make on the desktop. When using a second monitor instead of a projector, select a mode expansion. This mode will allow you to perform multiple tasks. One monitor will be working with you and the child can watch their favorite cartoons on the other monitor. The last mode is only for viewing images on the projector. This mode is convenient because the primary monitor is not included, allowing you to save battery power notebook. Any modern laptop can connect the monitor, thus expanding the capabilities of the screen. And removing the laptop to the side and connecting it to the keyboard and mouse, you will get a regular computer with the usual keyboard and monitor. 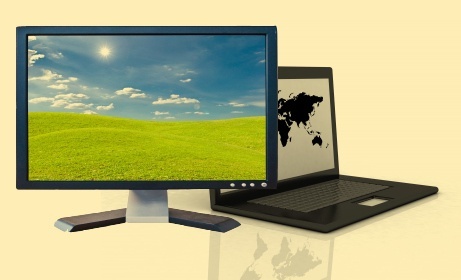 Connecting the monitor to your laptop, you can not only display the image on larger screen, but also to extend the desktop, using the laptop display and the monitor screen. This is especially useful for designers, designers, as well as those who need to work simultaneously in multiple applications. To connect a monitor you need to connect it to the mains and VGA cable to connect to the same connector on the notebook. After you have connected the VGA cable, click the right mouse button on the desktop and select "Properties" or "Personalization". Go to "display Properties" or "graphics Options" and select one of the options for image output: "laptop", "monitor Only, Monitor, and laptop (backup image) or "Advanced screen". Selecting the monitor as the output device and the image from the laptop will be transferred to the monitor. If you need the same image on the laptop and on the monitor, select the item "Monitor and notebook". If you need to extend your desktop, select the "Advanced screen". 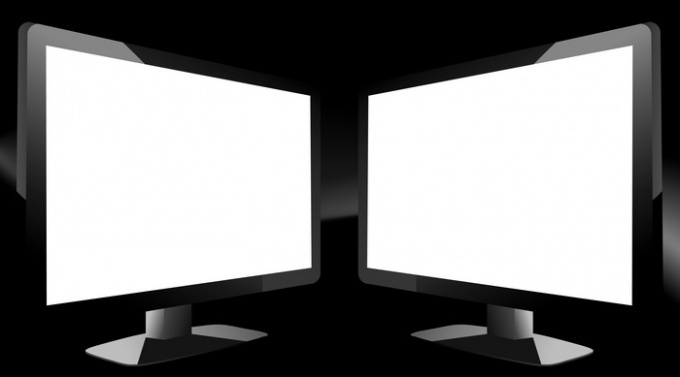 Similarly, you can connect to your laptop and modern LED or LCD TV because these TVs with high resolution can fulfill the functions of a conventional monitor. Many owners of laptops use this handheld device as the main computer. But if you want to watch video, much more comfortable to use a large screen modern TV with wide screen. To laptop make the output on the external display, you need to have a suitable connecting cable and make a small change in the operating system installation. - the connection cable (HDMI or VGA). Determine which cable to transmit the signal from the laptop to the screen you need. 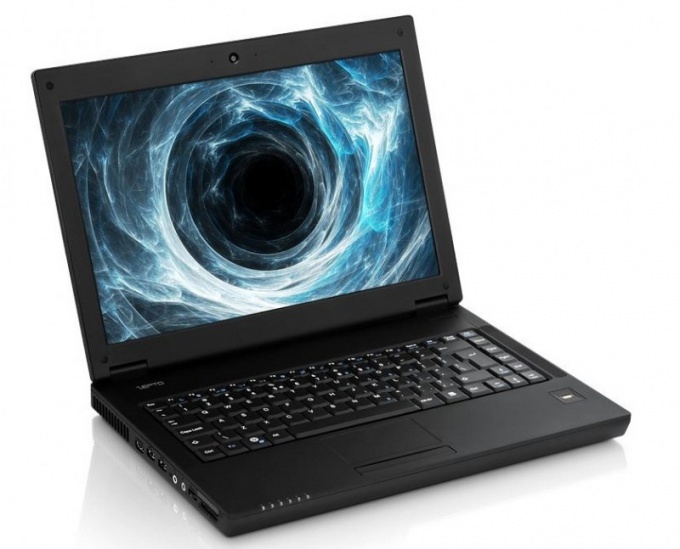 Depending on how new you have the technique, there can be different versions of the outputs on the laptop. On laptops the past two years used the HDMI interface. The same method of signal transmission support flat panel TVs and many monitors of large size. You can easily identify it by the inscription HDMI and a form similar to the conventional connector for flash drives. The difference is the width of the slot of the cable and the number of contacts. If the notebook and the external display is the interface, find the appropriate cable. It is often found in the TV package. Or you can buy it in any store for computer and consumer electronics. In the case when one of the devices is not HDMI, check another popular connector is VGA. It looks like blue ground with two rows of holes, sometimes on the sides there is space for clamping screws. Again check, not only on laptopbut also on display was the same interface. Then buy a VGA cable with connectors "father-father", that is, the contact needles on both ends. Connect the laptop to an external display. To do this, connect a VGA cable or HDMI sockets of your devices. This should be done with the power off. This also applies to laptop and screen. After checking the reliability of contact of the connector and socket can turn the equipment into the network. Configure additional output image on the laptop. Right-click the mouse on an empty space of the desktop and select "Properties" for Windows XP. Then select the "Settings" tab and you will see the setup menu, the outputand the pictures. For Windows 7 or Vista, click "start", go to "control Panel" and go to "appearance and personalization". Then click on the "menu Screen", item "configure display settings" or "Connect to external display". Activate the "Find" button if the system does not outputit schematic representation of a second screen. After that select the operating mode: duplicating the same image on both screens or only the external display. When you select the message "Save mode used screen?". Confirm your decision and click OK to close the preferences window.